I've seen a few, very cool mods done by some members on their boats ranging from newly mounted GPS's to TV's on arches to windlass anchors to even some very interesting and really smart mechanical innovations that create better functionality to certain, existing systems that these awesome Chaparral boats come with. I'm interested to see what people have done (I'm sure others are too) so that the light bulb can go on and possibly open the door for a cool modification on one's own boat. Even with trailers, there's so much cool stuff I've seen people here add/modify to make their trailering better and safer. I know I'll be adding a TV to the inside of the arch on my boat and I'm contemplating possibly installing a bow thruster and I have a few other smaller things I'm thinking of doing. Please share yours and show 'em off WITH PICS as much as possible. Too many to post again ... you might want to search the forums to get a broad range of mods people have made over the years. How about some recent and more unique ones? Future ideas? Honestly I find searching this site useless lol. Maybe I haven't spent enough time messing with it but if never seem to get what I'm looking for even if I know the thread is out there. Plus everyone started a different thread for their own mods. 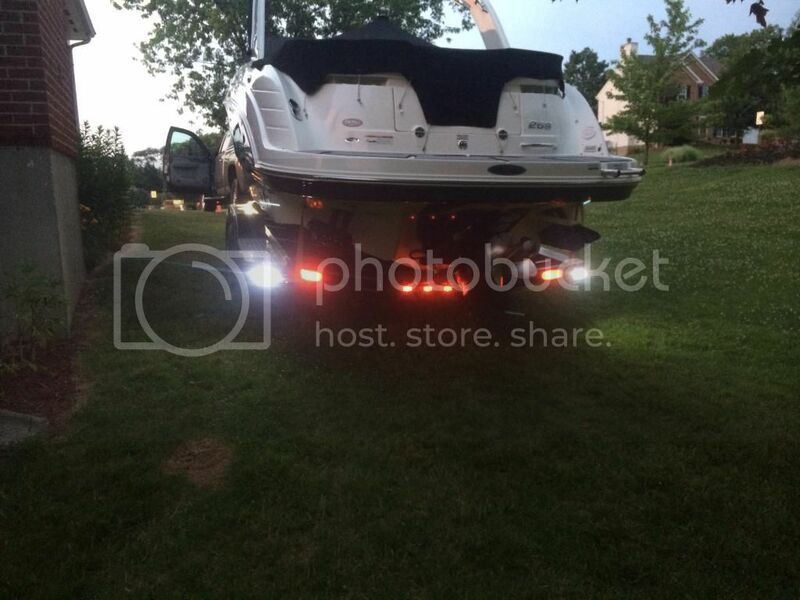 Anyways I added reverse lights on my trailer for my most recent upgrade. I found the LED lights online for ~$9 so if figured what the heck. I hated not being able to see behind the trailer when backing up. Even if someone was directing me I couldn't see them until if tapped the brake. I share the same exact sentiment as far as the uselessness of searching other threads. I do it for bit when I'm trying to find a solution to a small problem I have instead of opening a whole new thread just for one issue! And it works for the most part. So at least I try to be considerate in that respect and besides, there's a zillion "How to Fix it" threads it's crazy! Bright reverse lights, what a great idea! Geez. I haven't stopped. The boat was such a blank slate when I got it. 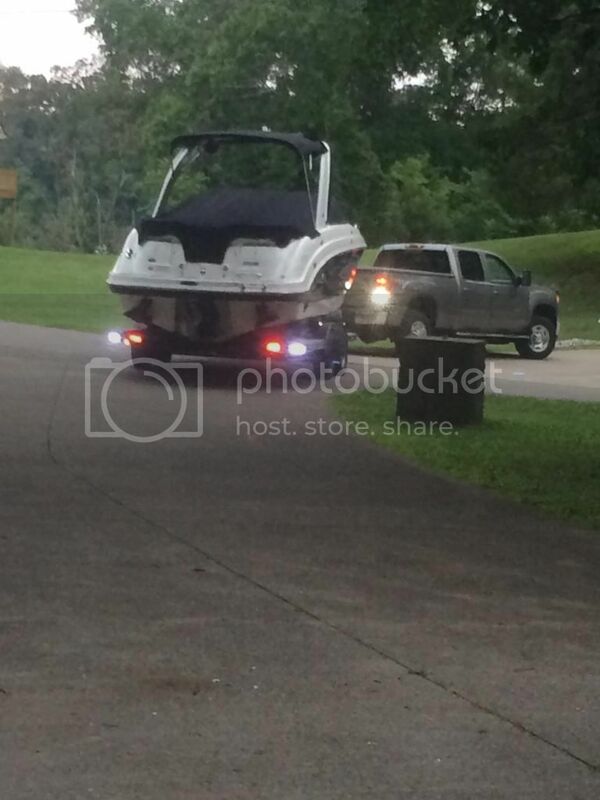 Put in a new stereo and extra speakers, cockpit lighting, added a bow and skeg guard for some bling, all new red ropes and fenders, table for the cockpit, Chappy graphics on the trailer, all before our first full year (2013) on the water with this boat. Got alot of pics on my gallery of those. This last spring I added these cosmetic changes. As far as searching this site, the built-in search functionality has a lot to be desired. But if you will use Google Search and just add "Chaparral Boat Talk" or "Owners Club" to whatever terms you are looking for, you will get a lot of hits that will take you directly to topics on this site. I might poke a pencil in my eye if we have one more "Prop Recommendation" post because there are so many already on the blog I can't believe there's anything that's not already covered previously here. But I know there's one more lurking around the corner - just a matter of time before it hits. +1 Keith. Google is a much better search tool for just about any forum. I might poke a pencil in my eye if we have one more "Prop Recommendation" post because there are so many already on the blog I can't believe there's anything that's not already covered previously here. But I know there's one more lurking around the corner - just a matter of time before it hits. Here's a pic of Keith, tomorrow. Same here Tom! My boat although old is basically unused and ready for years of service. Like yours, it was 100% factory stock. I haven't had the chance yet, but I'm going to add a dual battery set up with a switch, a new four speaker sound system with a sub and new head unit, sea dek, smart tabs, redo the canvas (snaps and zippers are corroded), redo the acoustic foam (It was mush when I got the boat so I removed it), and then I may look into getting the stripes/decals redone in the future. Also, if I ever have any issues with my y-pipe leaking from salt water corrosion, I may just go straight through hull and make it as quiet as I can using muffled tips and rubber exhaust hose etc. Honestly, my old Sunesta has been so perfect for how we use it, that I really haven't felt the need for much modification. Nearly everything I've done is electronic. I added a good two-bank battery charger, along with a 500W power inverter in the big compartment forward of the helm. That's strong enough to run a blender or an air-pump. I also added a VHF and a GPS, as I go off-shore. 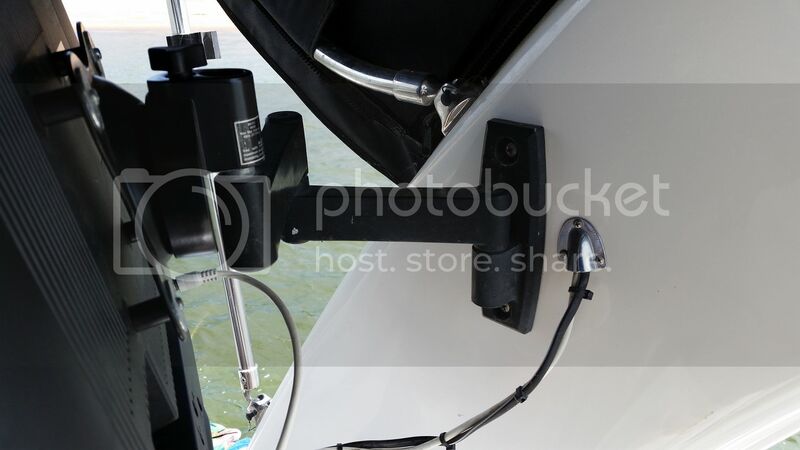 I added a triple-set of power 12V outlets in the starboard gunnel compartment below the throttle lever, so I can charge phones and ipods/ipads while they stay dry down there away from the possibility of getting hit by rain or spray. Other minor things- I took out the bow ladder, as we never used it and it got in the way of anchoring. I also swapped out the cotter pins in the rear top frame for stainless screws and lock nuts, as I never lay the top flat, and this way I can clamp it all down tight enough that it doesn't rattle at all, even with heavy wind at top speed. I replaced the gas piston (that rusts) in the transom trunk lid with a stainless spring that mounts to the hatch frame instead of to the compartment floor. This got rid of the rusty cylinder and opened up the floor of the compartment for bigger fenders and stern anchor. Really, minor stuff, but little things that make the boat more livable. I'll probably add trim tabs at some point, but not sure when, or if they're really that necessary. I added a teak cockpit table recently to replace the stock white table and to add some guest capacity via table extensions and cupholders (in another post on the site). Also as my boat hit 8 years old, the cockpit carpet back disintegrated and my cockpit canvas rotted so replaced them. Next on my list is to replace the cabin snap-in carpet -- either with new carpet or teak slats or teak/holly floor -- still working on which solution! Minor tweaks included adding ipod cable to the stereo (not easy to get behind the cabinet) and adding nylon washers to all the canvas poles/joints to make them less noisy. 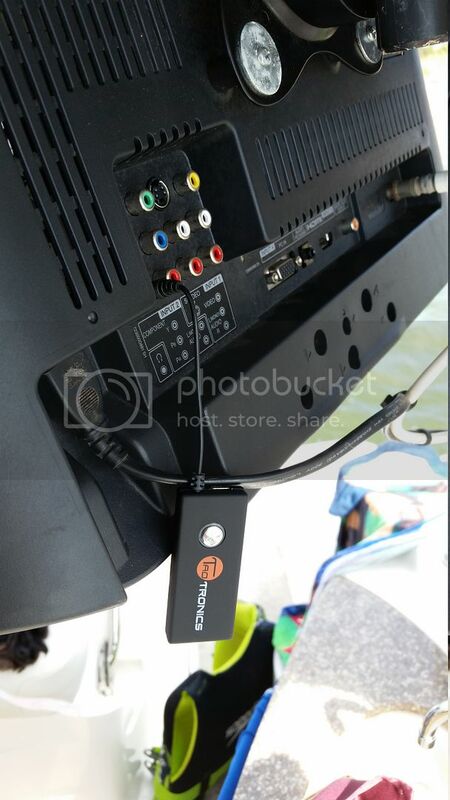 I have the LCD TV's, so I bought a simple cable to allow the galley TV to run off of the 12v lighter receptacle instead of 110v stock answer -- same for the digital tuner, since the 2005 LCD TV's pre-dated digital tuners. Also added fender holders to the bow rails which freed up some room. Magma gas grill on a rod holder mount is one of my most used items. And a 12" 12v fan for staying on the hook, since we don't have a generator (and I can't justify making that investment for a few days a year -- though I keep researching the Honda portable gen options...). Still trying to figure out whether to upgrade to LED lights. 22yrs of add on's, too many to list. Let your imagination run wild. Denny. Some really great stuff already, especially the little ones that actually make big differences. Triple set of 12vt outlets is a great idea, Joe! I know I can use that with all the gadgets I bring on board that need charging all the time. Love that one. That teak table is fantastic (I did see it on your thread, 270owner), but I'm glad you posted it again and all the other stuff you did like the iPod to the stereo and 12vt fan, don't think I've ever seen one of those. They make personal ones you can carry on you and also ones that you can mount on your boat in a certain way so it detaches and floats off should your boat sink. Sends an immediate beacon to the coast guard and they get you out of the water before you catch hypothermia. I think that's almost a must if you're trekking long distance in open water. You know, even though my docking skills have improved quite a bit, and I've found out that docking ocean is A LOT more challenging than fresh water which is most of you guys on this board lol....... ......(pat on the back)......that perhaps it might not be something worth the cost in the end. The only reason I had contemplated it was because the first 4 or 5 times at the dock with current and wind were REALY, REALY difficult and it was a struggle. I'd watch the bow take off with the wind and I'd be like WTF!?!? So I started seriously considering it to help me with that plus eventually, when the admiral does things on her own it will be easier for her as well. But, it still might not happen depending on the cost AND depending on if I finally decide to bottom paint the boat. I'm leaning towards not bottom painting it even if I'm gonna slip it next year. That beautiful gelcoat underneath it would be a shame to cover up BUT, if the bow thruster does go in, no choice but to bottom paint because it's inevitable. Once you cut the hole in the bow for the PVC cylinder and glass the two ends into the hull, you have no choice but to at least repaint the gelcoat and by then I might as well BP. Lining up the holes on the bow so they're symmetrical and even is actually a piece of cake. Laying out the round hole on the angles hull is also easy if you have the proper tool for that process. Usually a bent, U-end rebar or any type of solid, metal rod. If it wasn't for my very limited knowledge of electrical systems and how to hook up the bow thruster motor, I would do the whole thing myself, Keith. I've studied the process of lining up the holes, cutting them almost exactly and fitting the tube and glassing it. There's really not much to it except for getting to that lower compartment of the bow near the stringers. Tough to do on the 276ssx. Then drilling the hole and mounting the electrically driven prop and you're 3/4 of the way there. The rest is electrical which I'd have to find someone who knows what they're doing to help. If I'm not mistaken, I believe your 276 may have a balsa core in the hull. That doesn't mean you can't add a bow thruster, but it does mean that you'll want to be one thousand percent sure the core is completely sealed, and that there's no way things could flex and perhaps open up microscopic cracks that could slowly let in water. Regarding the EPIRB, yeah, I think that's a great idea. I do plan on getting one, as I plan on fishing reefs further out. Right now I limit my off-shore trips to about 15 miles, which is well within radio range. I have my GPS hooked up to my radio and have am MMSI number, so my DSC distress button should get quick results, but I really should also have an EPIRB. has anyone added storage bins in their engine room? Should I just screw down rubbermaids or milk crates or do something more sturdy/involved? On the bowthruster, I used to have a 1998 Chris Craft 245 Cuddy that had 1 engine and caught a lot of wind and was on a river with strong tidal current. One thing that worked for me in heavy wind and/or strong current was to back up rather than try to swing the bow around against the wind. It was a duoprop, so it didn't walk much and the engine could "pull" straight into the wind until I found an angle to get enough momentum to bring the bow around. Also, I found that using lines and pivoting on the pilings is another way to get into slips without a bow thruster. Though I always thought a bow thruster would make it so much easier! I keep my 270 on a river in Chesapeake Bay Annapolis, on a lift. Everyone I know who's not on a lift says that bottom paint is a must -- so be careful about going too long without it. When I take a week-long trip on the Chesapeake away from my lift, I start to see a stain of green-type growth appear already. I don't think it's balsa, Joe. I read some of the construction information (as a matter of fact, Drew opened up a pretty cool thread on how much wood is used in Chaparral boats and we discussed a lot of stuff on that) and found out that most of the stringers and risers Chaparral uses is pressure treated wood, including the plywood (at least on the newer boats maybe 2008 and on). My only difficulty will be accessing that area of the bow, since there is no immediate access in that bow area (that I'm familiar with anyway) to get to the front, lower compartment near the keel/bow area below the cockpit tub. I think the only way will be to remove the walls and floor of the bow, floor locker. If that's the case then we won't even bother, to tell you the truth. I've been out there many times and have had some great fishing times! This will be on next year's destination but we'll have to pick a really good day to go out there on a bow rider and only when this EPIRB is mounted, for sure. Like you and everyone else, I love my family too much to put them in any hazardous situation without having the most safety procedures implemented. Yes, we talked extensively on a few threads about spring lines like you mentioned. A lot of guys on here are pros at that type of thing like Keith and TomJo. It's definitely a luxury item and I think my docking skills have improved quite a bit that we'll survive without them, I think. Do you have that much room in your engine compartment to mount storage bins? That's actually a really good idea, now that I think of it, to store some of the "handy/mechanical/stuff" that won't be affected by the temperature and fumes generated in there. Hatem, I found that thread. It's an interesting one. It did make me think of one more addition I put on my boat that you might be able to use on that stern rail of yours. Clamp on rod holders are very useful back there. Very nice looking boat, by the way. I've always quite liked the 276- one of my favorite Chaparrals, by far. Thanks, Joe. We're all very happy with it. Funny thing I just realized recently is the 276 is now the 287?! Either way, whatever number is fine. We are totally bummed out the season is already over. You Floridians are extremely fortunate in that climate, despite the sometimes overbearing heat and humidity in the summertime, it's probably something I could easily get used to and you probably are, especially when you're on the water and do a lot of boating. No wonder almost everyone wants to retire to Florida. I have bought a few rocket launchers and they're ready to go, believe me. Know that you mention it, that is a good spot for those! Thx for the tip! It's not perfect, but the better you are at putting more of the right words in the search list the better the results are. Have been searching this thread for pictures of mods. I'll tell you what, once spring rolls around, I'll be happy to flood this thread with pics of new and cool (hopefully unique) mods which is what we've kind been looking for like BWW's back-up bright lights and Joe's few simple big difference makers and Owner's teak table. Definitely some of the more unique stuff I've seen rather that the conventional GPS mount or stuff like that. Waiting to hopefully see Texas Pilot's TV hook-up that he posted on the other thread. That would be nice to see how it was done. Someone who has a boat without an arch and does a folding TV or even a pop-up one for night on the river or even at the slip. Things like that would be great to see and please spare us the doom and gloom posts about been there and done that! The mount itself has two swivel points (laterally). they are loose and I'm not sure how to tighten them. 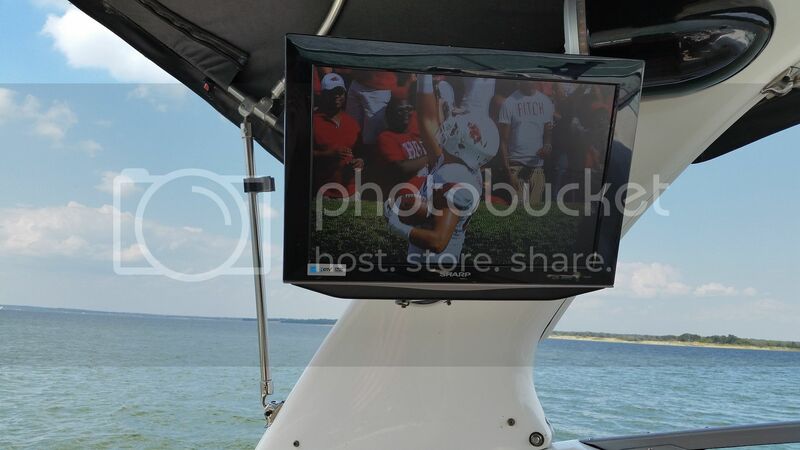 End result is the television won't stay in one position in any breeze or certainly when cruising. I think there are some recessed bolts I can tighten, but haven't taken the time to look closely enough. Attachment point to the arch is rock solid. 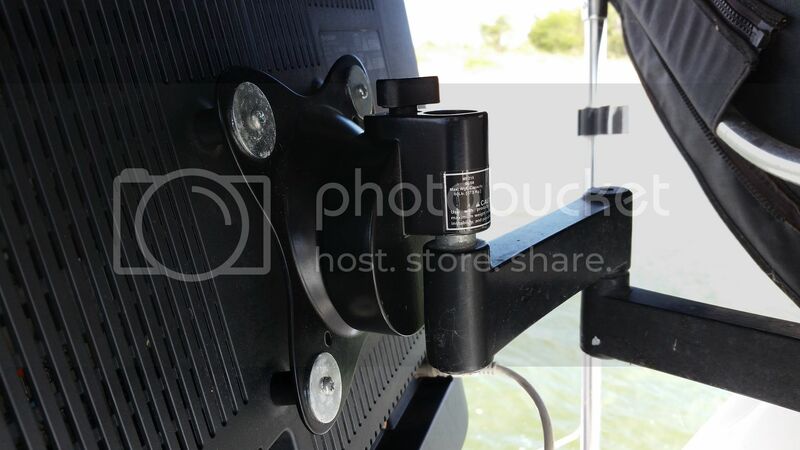 My advice would to make sure the mount you buy includes an obvious way to adjust the tension on those swivel points. I've even seen some mounts that mount the television right against the arch with no swivel in any direction. That's a limitation I don't think I'd like. Especially on sunny days when you need the screen directly in front of you to reduce glare. Anyway, let me know what questions you have. As I mentioned earlier, I didn't do this project nor do I know who did it. SO my answers may be limited.